An elegant filigree frame in shimmering foil lends a Victorian look to these beautiful seal and send wedding invitations. Select design elements and all wording are printed in your choice of colors and fonts. 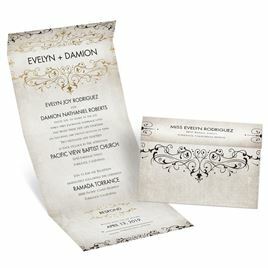 Seal and send invitations feature a perforated response card printed with your return address on one side and your response wording on the other. Guests fill out the card, remove it and return it to you (be sure to place a stamp on the card for guests' convenience). The price includes printing your wording inside and your return address on the outside flap. Personalization Options: Your choice of ink color, foil color, fonts and wording. Overall, extremely happy with my invitations and have received numerous compliments on them so far. Although we were told that duty was included in the shipping price, I was charged for this upon delivery. However, customer service was extremely responsive and helpful in assisting to resolve this one issue. Very pleased with how these came out. Easy to assemble. A couple of them were folding slightly crooked, but I was able to correct it.